Indoor or outdoor waterfalls and fountains are a focal point that can bring serenity to your home and business. Because of a unique look glass brings, it will make your waterfall/ fountain look even more elegant and stylish. For example, in our first picture that you see, the water fountain by itself would look like a regular and ordinary one. 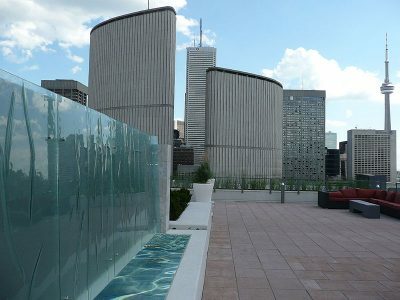 However, because of the unique textured and shaped glass structure, it looks fantastic. 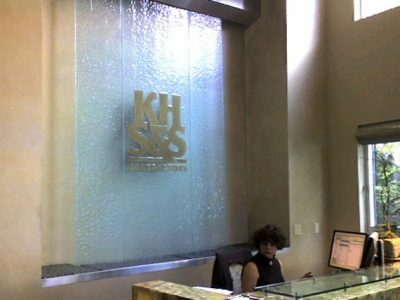 The greatest thing about being able to customize the glass, is the fact that a commercial customers are able to put their logo on the glass, behind the waterfall(as shown in our third picture). By doing this, you will be able to give your business a sophisticated, professional look. Using glass for your waterfall or fountain will help you achieve a soothing, yet vibrant feeling in the room. Using any texture we offer with water, will make it look even more beautiful. 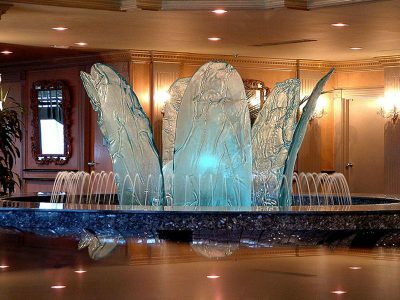 Waterfalls and fountains are known to be soothing and relaxing, and by working with CBD glass to create your waterfall, you will be able to achieve a luxurious atmosphere in your space. We can accommodate any size, color, and texture in order to make sure your project is up to your standards.